From the worldwide bestselling author of Eat Pray Love: the path to the vibrant, fulfilling life you've dreamed of. People of all ages and walks of life have drawn inspiration and empowerment from Elizabeth Gilbert's books for years. Now this beloved author digs deep into her own generative process to share her wisdom and unique perspective about creativity. With profound empathy and radiant generosity, she offers potent insights into the mysterious nature of inspiration. She asks us to embrace our curiosity and to let go of needless suffering. She shows us how to tackle what we most love, and how to face down what we most fear. She discusses the attitudes, approaches, and habits that enable us to live our creative lives to the fullest. Balancing between soulful spirituality and cheerful pragmatism, Gilbert encourages us to uncover the "strange jewels" that are hidden within each of us. Whether we are looking to write a book, make art, find new ways to address challenges in our work, embark on a dream long deferred, or simply infuse our everyday lives with more mindfulness and passion, Big Magic cracks open a world of wonder and joy. 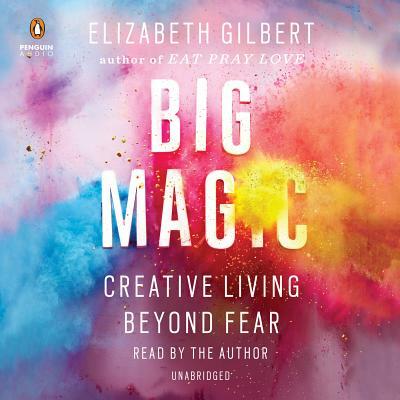 Elizabeth Gilbert is the #1 New York Times bestselling author of Eat, Pray, Love, and several other internationally bestselling books of fiction and nonfiction. Gilbert began her career writing for Harper's Bazaar, Spin, the New York Times Magazine, and GQ, and was a three-time finalist for the National Magazine Award. Her story collection Pilgrims was a finalist for the PEN/Hemingway Award; The Last American Man was a finalist for both the National Book Award and the National Book Critics Circle Award. The follow-up memoir Committed became an instant #1 New York Times bestseller. Her latest novel, The Signature of All Things, was named a Best Book of 2013 by the New York Times, O Magazine, the Washington Post, the Chicago Tribune, and the New Yorker. Gilbert’s short fiction has appeared in Esquire, Story, One Story, and the Paris Review.